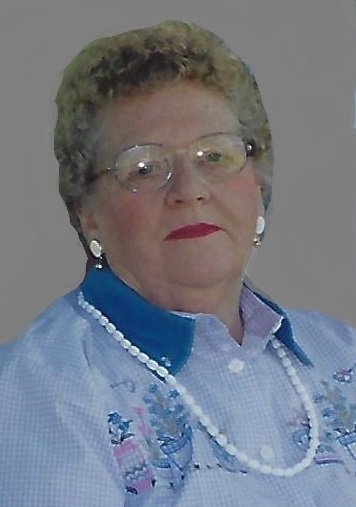 KINGFIELD - Thelma V. Cyr, 87, was called home to be with the Lord on Feb. 6, 2019, at Russell Park Manor in Lewiston. She was born in Temple, the daughter of the late Bernard Barker and Nellie (Boyce) Stevens. Thelma married Leonard Cyr and they were married for 55 years before his death on Oct. 12, 2001. While they lived in Stratton, she worked at Forster’s. They moved to Kingfield and there she worked for H.G. Winters and Sons. She was a ballot clerk for the town of Kingfield. Thelma was a member of the senior citizens group and loved playing cards. Thelma is survived by four daughters, Cindy Boutilier of Lewiston, Sheryl Flament of Auburn, Patricia Churchill and husband Braden of Kingfield, and Jeanie McDonald of Auburn; five grandchildren; four great grandchildren; one great granddaughter on the way; brother, Clarence Barker of Stratton; and her special cousin, Sue Brenna of South Dakota. She was predeceased by her husband; her parents; son in-law, Mike Boutilier; two great grandsons, Johnathan and Berkley. A special thank you to B.J. Smith for coming to her home to sit with her. Also, a special thank you to family and friends who took her to the doctors. Donations in Thelma’s memory may be made to the Western Mountains Baptist Church, PO Box 264, Kingfield, ME 04947, where she was a member. At Thelma’s request, there will be no visiting hours or funeral. A graveside service will be held later in the spring, at the convenience of the family, at the Fairview Cemetery in Farmington. Arrangements are under the care and direction of Dan & Scott’s Cremation & Funeral Service, 488 Farmington Falls Rd., Farmington, ME 04938. Awwww, our sincere condolences to you Pat and Braden, hold on to the memories, thinking of you guys. Condolences to the whole family. You have many memories of Thelma that you can hold on to. Thinking of you all! My deepest condolences to you all at this time. Thelma was a special lady. Thinking of you all and remembering fondly of all the memories of childhood times. Hugs to each and everyone of you. Her smiling face will be missed at Western Mountains Baptist Church. Condolences to the family. Condolences to the family. Sending prayers. Sorry for your loss. I enjoyed Thelma's company when I worked in Kingield. Condolences to the Cyr family, many fond memories growing up around you guys, I miss Leonard and Thelma will be missed. Our deepest condolences to the Cyr family.